Fernglen B&B offers you two well appointed guest rooms, 'Rangi' and 'Tane' with modern guest shared European style bathroom. 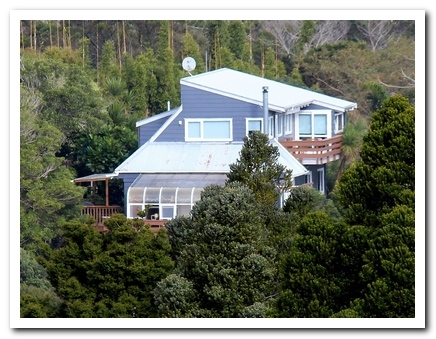 We are surrounded by native bush and enjoy a marvelous sea view to Soldier's Bay. We share a passion for our environment and take pride in sustainable living as much as possible. 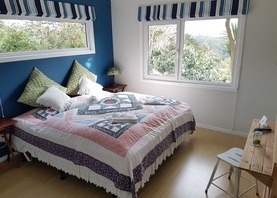 After a good night's sleep in your lovely quiet rooms, enjoy your scrumptious continental, fully cooked, or continental breakfast either in the charming dining area or on the deck with magnificent 180 degrees bush views. Fit for the day there are several options of recreational activities in the vicinity. A walk through nearby Fernglen Gardens for example or a trip to Auckland's vibrant city centre. We are happy to recommend excursions and activities. Your host is also an experienced tour and city guide and can offer tours in her own licensed luxury vehicle. 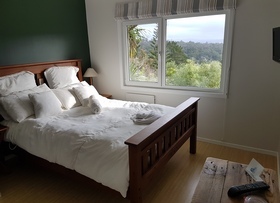 We also cater for tour arrangements should you conitnue your journey through New Zealand. On your return why not enjoy a good book from our library while sitting on the deck or use our in house sauna for a bit of relaxation. View a beautiful sunset over Waitemata's soldiers bay and look forward to another relaxed night.